France is known for its highly-influential style of cooking. Dating back to the 14th century, French cooking is an art that has evolved into France’s gift to the world. It wasn’t until the 20th century that French cuisine became the high-level haute cuisine that we now know it as. One dish that is synonymous with French cooking is beef bourguignon. This French beef stew is a dish that is enjoyed both in fancy French brasseries and kitchen tables across the world. Beef bourguignon is also a very practical dish that can be made using a slow cooker. At The Paris Guy, we believe that anyone visiting The City of Lights should experience all aspects of its cultural splendor. We offer a large selection of Paris tours for those who want to a complete cultural experience. Experience the best of France’s culinary history on The Paris Guy’s exclusive food tour through Paris’ Le Marais neighborhood. Enjoy sumptuous oysters, French cheese, crème brûlée and of course, beef bourguignon. Beef bourguignon, also known as beef burgundy, is one of France’s most well-known dishes. A simple beef stew consisting of beef, carrots, onions and mushrooms, beef bourguignon is elevated by the presence of red wine. 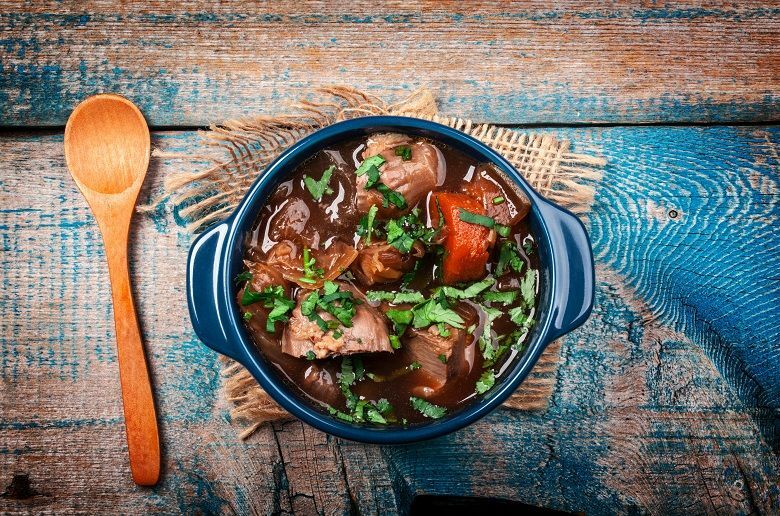 The first documented instance of beef bourguignon was recorded during the 19th century. While the burgundy name makes it easy to assume that beef bourguignon is a local dish from France’s Burgundy region, the name is actually derived from the red wine used in the recipe. The dish wasn’t associated with the Burgundy region until the 20th century. Aside from being a staple dish in French cooking, beef bourguignon is also a very practical dish. Its use of simple ingredients such as beef, wine, carrots and onions makes it very easy to prepare. Beef bourguignon is also a dish that can be prepared ahead of time, even as far ahead as a day in advance. This makes beef bourguignon a great slow cooker option. Simply combine the ingredients in a slow cooker and have a complete French meal ready by evening time. Beef bourguignon is also a dish that gains flavor when reheated, making it the perfect dish to bring to work for lunch. According to Julia Child, the best wines to use in beef bourguignon recipes are full-bodied red wines. French red wines such as Beaujolais, Côtes-du-Rhône, Bordeaux and Burgundy are perfect wines for a beef bourguignon recipe. Beef bourguignon is traditionally served with boiled potatoes. However, buttered noodles or steamed rice also make for an ample starch to serve with this dish. Another secret to a good beef bourguignon is bacon. For 6 people, a 6-ounce chunk of bacon cut into lardons (¼ inch thick and ½ inch long sticks) is a great option for a quality beef bourguignon recipe. Which Beef is Best for Beef Bourguignon? The types of beef best used in a beef bourguignon recipe vary according to time and budget. Stewing beef, chuck steak and brisket are generally used in a beef bourguignon recipe. For slow cooker recipes, stewing beef is a perfect option as it is less expensive and becomes more tender when simmering in liquid. Try making the dish for yourself with this easy slow cooker recipe. Pat the beef dry, then season with salt and pepper. Heat a large skillet to medium high heat, then add olive oil to the pan. Add beef and sear each side for 2-3 minutes until the meat is slightly browned. Put the seared meat into the slow cooker. Add bacon lardons to the skillet and saute until browned. This should take no more than 3-4 minutes. Then add the bacon to the slow cooker. Add onions and garlic to the skillet. Saute for 2-3 minutes, the onions should be translucent. Add onions to slow cooker. Add red wine to the skillet. Scrape all the brown bits of the bottom of the pan. Add the beef stock and tomato paste to the pan, whisking them together and scraping the pan until everything is removed. Add bundle of thyme and the red wine mixture to the slow cooker along with carrots, mushrooms, and pear onions. Stir and cover the slow cooker. Cook on LOW heat for roughly 6-8 hours. Garnish with extra thyme or parsley. Serve or save for later! Where Can I Find Beef Bourguignon? If you’d like to try beef bourguignon for yourself, the dish can be found in many fine dining restaurants and French brasseries. Try beef bourguignon from the slow cooker at home, then try it from a restaurant menu. We recommend searching for local restaurants that feature the dish on their menus. Still, the dish is an easy dish to prepare and a great way to experience French cooking while feeling accomplished after making it yourself. Of course, there is no substitute for trying an authentic beef bourguignon in the place it originated: France. The many brasseries in Paris feature beef bourguignon prepared artfully by expert French chefs. Why not experience the culture of France and its elevated form of cuisine for yourself? If this sounds interesting to you, try our Paris food tour and one of our many tours of France for yourself. Experience what the French call le bon vivant.